Our client, Miss Emily Wilbraham, instructs me to inform you that with the arrival on her premises at half-past seven this morning of the entire percussion section of the Royal Liverpool Philharmonic Orchestra and several of their friends she has no course left open to her but to seek an injunction to prevent your importuning her further. The course of "true love" does not always run smoothly, especially with a beau obsessed with birds! Happy Dancing for a big finish! 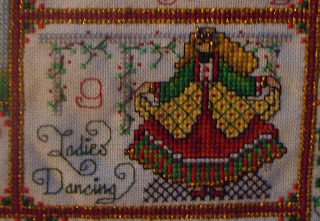 The border took me nearly all year, stitching a bit each evening while my son was in the bath. There is a single row of dark red and a row of metallic on each side. Very time-consuming and tedious. 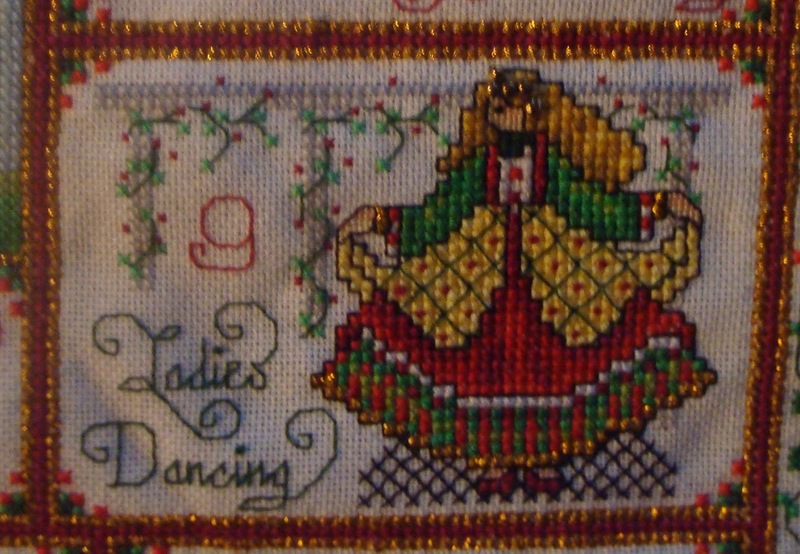 Each month I completed a block and showed it as part of the Christmas Ornie SAL and also on here, with the appropriate chapter from John Julius Norwich's book. I do recommend that you all get a cop of that book as Quentin Blake's illustrations are marvellous. I have bought a gold frame and will be framing it later this week, ready to be displayed for Christmas. Finally, the Advent Calendar is going well again this year, lots of beautiful festive stitching and some great ideas for how to spend Boxing Day. We still have more doors to open, with some being double door days so keep checking back each to see the latest picture and link. Congrats, it looks really wonderful!AriadnefromGreece! OMG I laughed so hard. Your 12 Days is gorgeous I'm sure your glad it's finished though. Congratulations, it’s beautiful and fantastic and a gold frame is perfect. How perfect that you finished before Christmas! Congratulations on a beautiful finish. I have loved watching this one grow. YEA!! I'm so happy you will have that amazing piece for Christmas,it is truly beautiful!!! Congratulations on a fantastic finish! Congratulations on your amazing finish, and just in time too! Woo hoo! Congratulations Jo! How awesome to have this done for Christmas. Congrats on the outstanding finish Jo. It is gorgeous. Wohoo!!!! Congrats. Enjoy that happy dance...you deserve it. Congrats on the big finish ! It is looking wonderful! That was a good plan to complete one block per month. What a gorgeous finish! It's nice how the 12 days fit so well with the 12 months of the year. But here I was hoping *so* much that there might still be a happy ending for Emily and Edward! Fabulous finish, I've loved watching this one grow. Boxing Day Renamed "Stitching Day"